Email marketing is possibly the most wonderful and effective form of marketing: communicating with your existing clients, and prospective clients that have specifically asked for you to stay in touch with them. 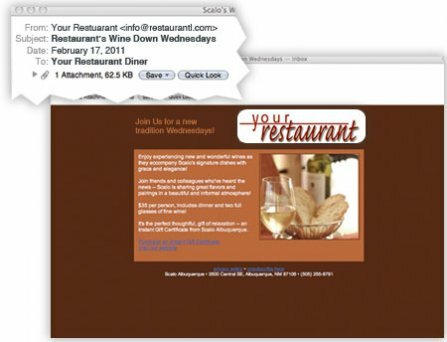 Email marketing is included at no additional cost with CoverBoom Dynamic Websites. You can easily change your email campaigns, or just let them run. With CoverBoom, it's easy to reap the benefits of email marketing, designed just for restaurants, with minimal or even no effort. They can sign up right from your website, and when someone purchases an Instant Gift Certificate they have the option of joining your email newsletter. What if I'm already doing email marketing? That's great! You can use CoverBoom's email marketing in addition, switch over, or just turn it off. CoverBoom has a great import feature for pulling in your address book from popular programs like Outlook and Constant Contact.